Farming toward the future on Short Grass Ranches Ltd.
Short Grass Ranches Ltd. was recently announced as both the Medicine Hat and District Chamber of Commerce’s Large Business of the Year, and as the winner of the Chamber’s highest award— its 2017 Award of Excellence. Randy Lehr is one of five partners in the corporation, working alongside sons Scott and Craig, brother Ken and nephew James. Lehr says it is a tremendous honour to be chosen as the winner in both award categories over some pretty stiff local competition. He is thankful to the Chamber for its recognition. “It validates what we are doing, is the big thing,” says Lehr, “and it is humbling to be mentioned in the same category as these other businesses. Lehr credits his dad Reiny, who sadly passed away a few years ago, for his foresight in establishing the solid foundation and corporate model for Short Grass Ranches Ltd. back in the 1970s. “He had a philosophy that served us well,” states Lehr. “If you joined as a partner, we were part of the business and we were shareholders. Dad taught us how to live together as a family, and how to work together as a family. We weren’t treated like employees. With corporate structure, and everybody being a shareholder and a partner, you don’t run into situations where you see with some guys they own land and they own cows, and they opt to farm together and stuff like that. At Short Grass Ranches diversity is the key, with every aspect of the business being backed by solid marketing research. “Marketing is huge today,” confirms Lehr. “You can’t have a set pattern where you are going to take them in and sell them on such and such a day as was maybe done more in the past. Markets move, and there are different opportunities through forward-contracting, through hedging, and this type of thing. There is times when there are opportunities to lock in a profit. We closely follow the Futures Markets on a day-to-day basis. All you need is a smartphone. “Our business is complex, and we really need to stay on top of things,” adds Lehr. “We have a cow/calf operation, we have a backgrounding feedlot, we have irrigated and dryland crops. Lehr says his company is always open to looking into new ways of farming to increase efficiency. Short Grass Ranches is currently undertaking research on its prospects to expand into companion seeding and double-cropping. “We tried something for the first time this year called companion seeding, where we seeded canola alongside peas because they compliment one another. Peas provide nitrogen for the canola because its a nitrogen-fixing legume. We used to have trouble with gophers eating on the canola when the plants were really young, but they don’t like the peas. So it helps keep the gophers away. Embracing new technology is also key to Short Grass Ranches success, says Lehr. He gives a few examples. Lehr says successful farming today means being on watch for opportunities to increase operational efficiency and enhance production through use of technology, better agronomy, superior husbandry practices, and capping it all off with strategic marketing practices which take advantage of pricing and other trends. 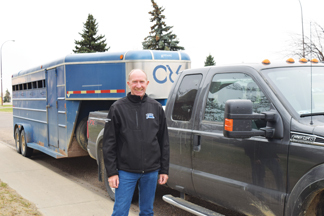 Randy Lehr is one of five family members who are partners in Short Grass Ranches Ltd. Since incorporating in the 1970s the ranch has undergone a great deal of expansion and diversification to meet modern agricultural needs and requirements. Short Grass Ranches is this year’s Award of Excellence winner at the Medicine Hat and District Chamber of Commerce awards, signalling a new appreciation for agriculture’s place in the local economy.